I knew at once that I had to recreate this and share the recipe with you. It turns out, like most Italian food, the recipe is actually quite simple. It consists of a pasta frolla case, (Italian sweet pastry), filled with visciole (sour cherries), and a mixture of ricotta chesse, sugar, and an egg to bind it. Visciole (prunus cerasus in Latin) are one of a few varieties of Italian sour cherries that include amarena and marasca. In the UK and the USA the varieties morello and montmorency are grown. Obviously they are only in season in the spring but they are often preserved in syrup, alcohol, or made into jam. 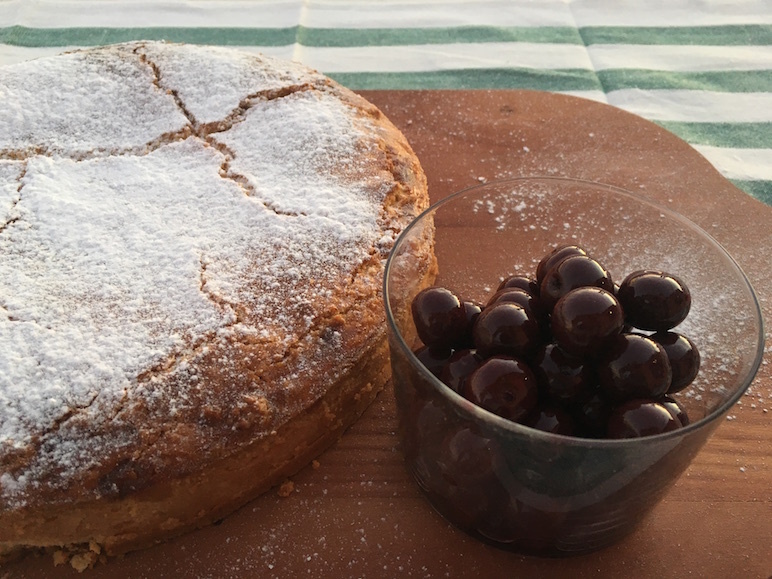 For this recipe I used visciole that had been preserved in syrup but you could make this with fresh (stoned) cherries, preserved cherries or even cherry jam. The Italian firm Fabbri make amarena cherries in syrup which work well for this and are widely available. Just drain them, rinse off the syrup and dry them. Ricotta (literally re-cooked) is a kind of soft white cheese made from the whey left over during the production of other cheeses. It’s very often mixed with spinach to form the stuffing for ravioli and other stuffed pasta all’uovo. It has a neutral taste which makes it perfect for sweet or savoury cooking. Again, it’s widely available. Enjoy the recipe and if you make it, let me know how it turns out. Cut the butter into small cubes and then add to the flour. Rub the butter into the flour with your fingers until you achieve the consistency of breadcrumbs. Add the sugar and mix through with a spoon. Add the egg, a bit at a time, and use it to bring the mixture together as a dough. You may not need to use all the mixture, depending on the size of the eggs. Mix the ricotta cheese with the sugar. Add the egg and mix through until combined. Line and grease a 20cm (8 inch) cake tin with plenty of butter. Divide the pastry into two pieces, one half the size of the other. Roll the larger piece out and use it to line the cake tin. Make sure that you have about 1cm (1/2 inch) hanging over the edge of the tin. Put the cherries in the tin and distribute evenly. Cover the cherries with the ricotta mixture. Gently fold the 1cm (1/2 inch) edge of pastry back over the filling. Paint the pastry edge it with egg wash. Roll out the smaller piece of pastry and cut it into a 20cm (8 inch) disk. Cover the top of the pie with the pastry disk. Make sure that it sticks to the area that you painted with egg wash. Paint the top of the pie with egg wash.
Bake for 50 minutes. If the top of the pie looks as if it’s getting too dark, place a piece of aluminium foil over the top. Leave to cool before removing from the tin, dusting with icing sugar, and serving. Have you ever eaten crostata ricotta e visciole in the Roman ghetto? What’s your favourite sour cherry dish? Oh both of those sound wonderful! I’d love to say this was my idea, but as you know it’s a traditional Roman Jewish recipe. And you must try it. It’s delicious. I have one piece left in the fridge for my breakfast … going to eat it now.